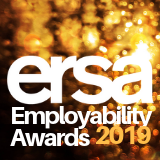 The Employment Related Services Association (ERSA), the representative body for the employment support sector, is pleased to announce the 2019 ERSA Employability Awards. The awards, now in their seventh year, aim to celebrate and champion best practice from across the employment related services sector, highlighting the day-to-day hard work and dedication of individuals and organisations in the sector working together to help jobseekers in their journey towards, or into employment. The ERSA Employability Awards welcomes applications from all organisations supporting jobseekers into employment or to progress in work, including the criminal justice system, health service, housing associations, employers, local authorities, Jobcentre Plus, training providers, Information, Advice and Guidance (IAG), colleges and universities. You do not have to be a member of ERSA and there is no charge to apply. The deadline for submissions is 5pm on Friday 15 March 2019. Information submitted to ERSA as part of the application process may be used in promotional work at other times, unless otherwise requested. Please therefore ensure a media consent form has been signed when naming an external individual or organisation. Our best wishes and good luck to all entrants.